I know the shield is a great bit of kit. Shield has 24p but why I picked Shield was it can do true HD atmos and dts hd master audio passthrough. Disappointing how few deals there are for this, literally the only item I've been waiting for a deal on. Yes have fond memory of that deal. If it was 99 again i would buy a spare! Agree current pricing is not really of interest. It's £159.99 with the controller, same as this. I'd seriously swerve the nvidia site. Digital river actually sell it for them.. come from the U.S. took me 3 months to get mine.. they said it was on process of shipping. 100's of useless pg8ne calls later, turns up was delivers around the corner too wrong house. Can it play h265 and iso files? I still this just for streaming, similar to Plex? Does it have its own OS? Apart from gaming, does this do anything over and above a smart 4k TV? You'll never see it at that price again. 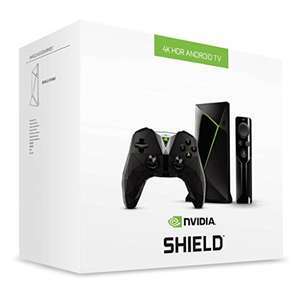 Nvidia shield was seriously underrated when it came out and seen as just an expensive android box. Recent updates that allow for HDR and atmos support make this the best media center around for the price. It can even run Plex as a server, not only as a client. As a client it will chew through everything you throw at it, not matter what codec (video and audio) without transcoding. Bought it from Nvidia website through the last deal on here, and I can surely say it has been the best purchase in years. Ordered on a Friday evening, got it on Monday morning. Same price click and collect from currys with quidco £1.30. Picked one up today!